VCCA Fellow and Resident Director of the Moulin à Nef in Auvillar, Cheryl Fortier just completed five weeks at Mt. San Angelo. Cheryl is known for her love of nature and her evocative and poetic paintings of water. In these works, Cheryl deftly conveys the way water looks in its myriad states, while masterfully capturing its elemental wateriness. While at VCCA, Cheryl found herself moving away from water for the most part, painting a striking series of interior views of other Fellows' studios after they'd been vacated. Not surprisingly, the paintings all have a watery quality. 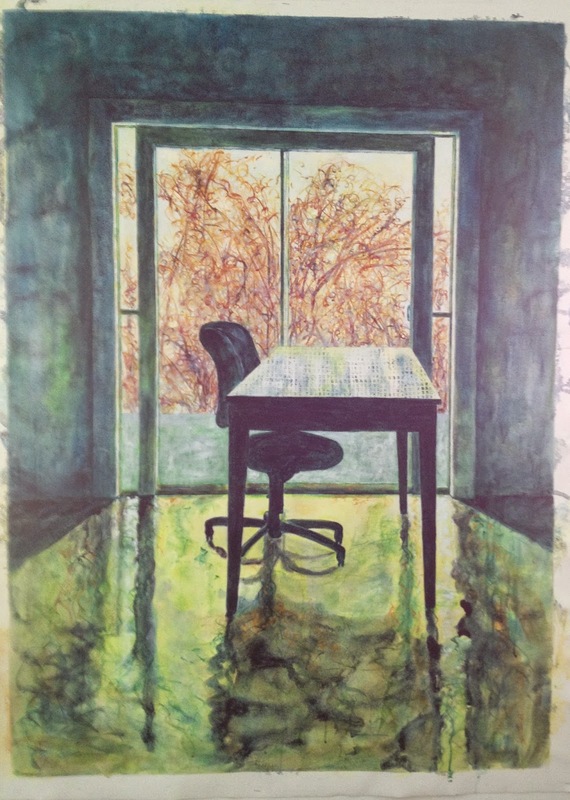 This is particularly noticeable in the view of a desk before a window, where sprightly brushstrokes and the play of light and shadow on the floor seem to suggest a limpid pool. 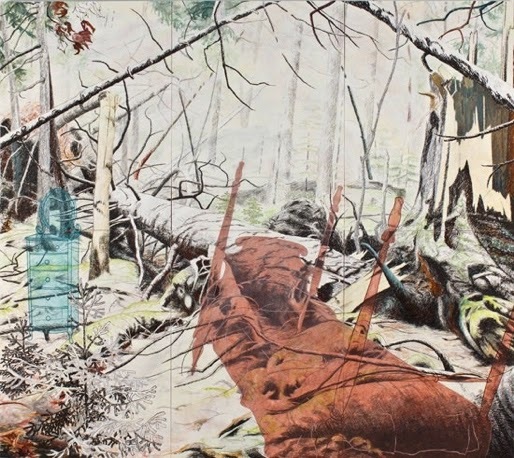 Prilla Smith Brackett’s Paintings in "Fractured Visions"
Prilla Smith Brackett’s paintings will be featured together with Amy Ragus’s photographs in Fractured Visions curated by Michele Cohen at the DanforthART Museum in Framingham, MA through May 15. Prilla approaches landscape conceptually employing fragmentation and the insertion of random objects that resonate with meaning to amplify the work’s effect. 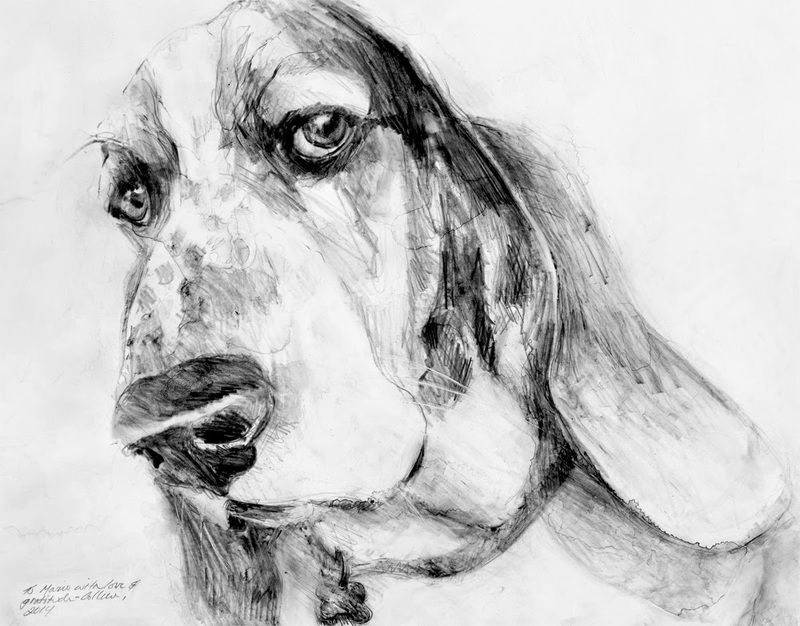 Jackie Hoysted’s work is included in Ne Pas Sourire at the Arts Club of Washington through March 28. 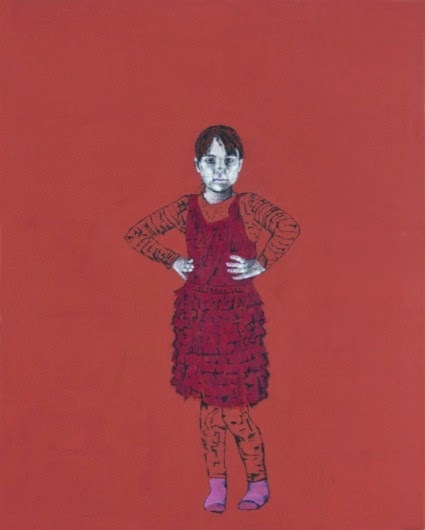 Curated by Christopher With, the exhibition also includes the work of Sandra Gober and Blair Jackson. Jackie’s portraits are both intense psychological studies and visually arresting compositions of color and line. Her models are positioned against a richly hued monochrome. Jackie pares the figure down allowing the focus to zero in on the deeply expressive faces. Treehouse, a solo exhibition featuring new paintings by Josette Urso will be on view at Kathryn Markel Fine Arts, New York. Josette’s works have densely packed surfaces of delicate marks, swirling brushstrokes and blocks of vivid color. 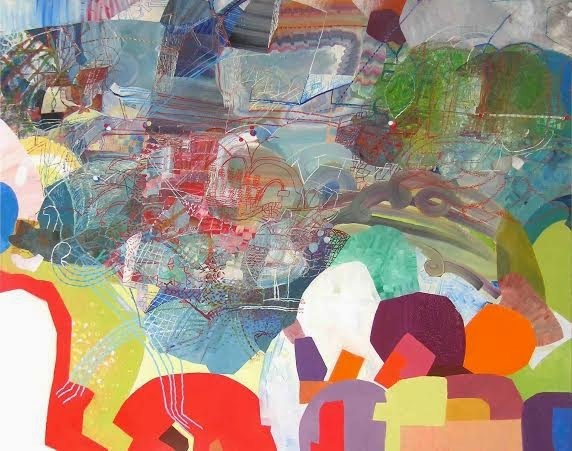 Her abstractions reference landscape, still life, and views of New York City where she lives. Allan Rosenbaum’s Binary a solo exhibition presented in conjunction with Lively Experiments: the 49th annual conference of the National Council on Education for Ceramic Arts in Pawtucket, RI March 25-28, 2015. Opening Reception: Friday March 27, 6-9 pm. 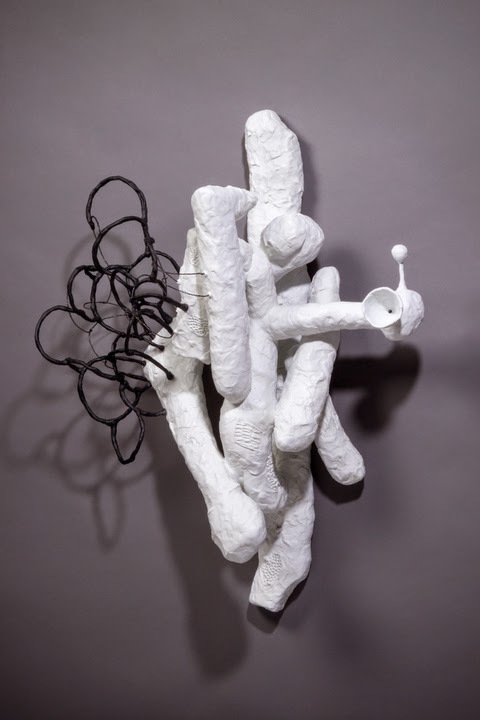 The exhibition explores the area between drawing and sculpture with epoxy clay sculptures that are mounted on the wall casting shadows that provide a visual echo underscoring the piece's form. Jeannette Rogers' Translations Featured in "Grains of Gold: An Anthology of Occitan Literature"
Jeannette Rogers reportsthat A dozen of her translations will appear in Grains of Gold: An Anthology of Occitan Literature (part of Francis Boutle Publishers’ Lesser Used Languages of Europe series). The anthology, which features Occitan writing from the 11th century to the present, has already received PEN England’s translation award. 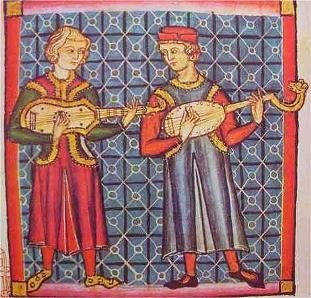 A Romance language spoken in southern and south-central France, the Val d’Aran in northeastern Spain, and a small part of northwestern Italy, Occitan is closely associated with the troubadours, composers of courtly lyric poetry of the 12th and 13th century. Colleen Kielywork has been included in MDC, a limited-edition book published as in honor of legendary Italian born poet, curator and critic Mario Diacono who typically displayed a single work in his Boston gallery. Diacono’s projects which entailed renowned international artists were accompanied by detailed and complex critical essays. Artist Luisa Rabbia conceived of and coordinated the project, with the support and sponsorship of Luigi Maramotti of the Collezione Maramotti. The book, which takes the form of a large Moleskin sketchbook will be published by Edizioni del Pareto. The Orange-and-White High-Heeled Shoes, a poem by Ellen Bass, is featured in the March 30, 2015 issue of The New Yorker, which also includes a link to her reading the poem on it’s online version. Ellen’s work has been published in The Atlantic, The American Poetry Review, The New Republic, The Progressive, The Kenyon Review and many other journals. Among her awards for poetry are a Pushcart Prize, the Elliston Book Award, the Pablo Neruda Prize from Nimrod/Hardman, the Larry Levis Prize from Missouri Review, and the New Letters Prize. Her books of poetry include The Human Line (Copper Canyon Press, 2007) which was named a Notable Book of 2007 by the San Francisco Chronicle and Mules of Love (BOA, 2002) which won the Lambda Literary Award. Joshua Zeman reports that he surpassed his Kickstarter campaign goal of $300,000. The funds raised will support an expedition to find “52, the loneliest whale in the world,” and also help raise awareness over the growing scourge of ocean noise pollution which affects the welfare of marine mammals across the globe. 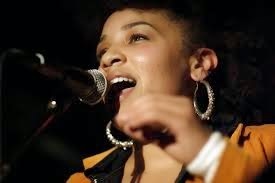 Funding beyond the goal will go into production of the film. Josh’s 52 The Loneliest Whale is a feature length documentary that tells the story of a whale, which has a call of a pitch that is a much higher frequency (52 Hz) than that of the other whale species with migration patterns that most closely resemble this whale's. 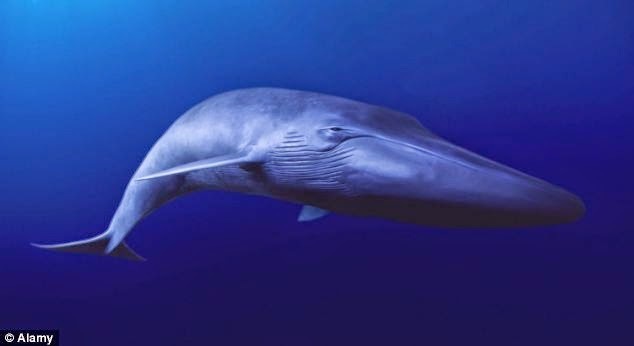 Described as the loneliest whale in the world, the mammal has been detected regularly in many different locations since the 1980s.